We are about to enter 70th year of Independence. And we remained colonial India. We are still living with a colonial mind set. We presented annual budget in parliament at 5 pm to suit noon time in England. We still address judicial authority as My Lord. We still wear black coat while appearing in court. We have separate VIP entry at places like airports as in British days. We have routes, like in British days, where traffic has to stop till they go past. Typically, at home, at work and in our society we successfully practice divide and rule policy as did the British. Look around and see how well they have divided us on caste, religion and region. Whatever was left of it has been accomplished by congress in sixty years. 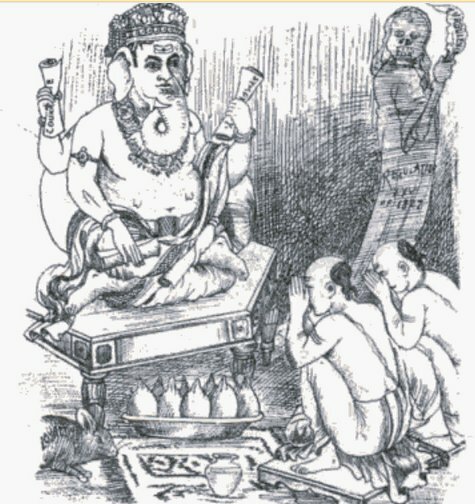 Concept of BAKSHISH (Refined word for corruption) was started by British. We are now experts in corruption. British looted India and its natural resources...Naive are those who need to be told who looted India after British left. It’s an irony that a civilian Defense secretary is administrative head of 1.2 million armed forces. Armed Forces follow British ranking system. Bureaucrat decides on the pay scales of the men in uniform as was the case in British Raj days since they didn't trust Army. British gave away land to church thus making it largest owner of non agricultural land in India. To acquire that land, we look so helpless even after almost a century since land was given. Missionary schools still do not recite national anthem. We still use IPC 1860 which as drafted to suppress Indians after 1857 revolt. We still use Raisina Hills as center for our government. We use British English and not American English for communication. We consider fair complexion as beautiful and dark complexion as ugly. We have allowed our elected ones to be masters and us as subjects. We expect our driver and peon to salute us. We address our domestic help as servant. Fortunately, We, as a nation have remained civil.......British had put up a notice saying INDIANS AND DOGS NOT ALLOWED…….We never use such phrase even for our enemies. As we look at ourselves, we have become more British than the British themselves. Let us CHANGE INDIA for INDIA OF TOMORROW. TOP…Cartoon issued by Congress (c.1889). 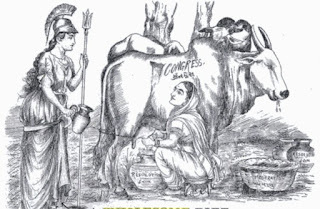 Cong distributes milk to Lady Britannia (Goddess Britain). Pledges Brit loyalty. You are absolutely correct. I don't know why we HAVE to follow these British practices. Here is my pet peeve. Just because someone has passed one entrance exam and joined IAS, does it make that person expert in everything?